Okatsu, Y. and T. Tsutsumi, 2019: Carabid beetle (Coleoptera: Carabidae) assemblages in the intermediate successional stage after Mt. Bandai eruption of 1888: Effects of environmental variables on carabid beetles in the Urabandai area, Entomological Science, DOI: 10.1111/ens.12352. 薄井創太・黒沢高秀, 2019: 福島県内に現存している半自然草地の現状と特徴, 福島大学地域創造, 30(2): 111-121. 鈴木絢美・川越清樹・藪崎志穂, 2018: 化学分析による地域スケールに対する降雪イベントの特徴, 土木学会論文集G(環境), 74(5): I_1-I_9. Ohira, H., K. Sato, T. Tsutsumi, S. Kaneko, H.-J. Choi,: DNA barcoding suggested the existence of cryptic species and high biodiversity of South Korean pseudoscorpions (Arachnida, Pseudoscorpiones), Journal of Asia-Pacific Biodiversity, (Accepted). 鈴木絢美・藪崎志穂・川越清樹, 2018: 化学的アプローチによる地域スケールに対する降雪プロセスの追跡調査, 土木学会論文集Ｇ(水工学)，74(4), I_865-I_871. 川﨑興太, 2017: 裏磐梯の来訪者特性調査の結果 －2013 年度から2016 年度の調査の結果－，平成29年度土木学会全国大会第72回年次学術講演会講演概要集，IV-105, 29-30. Satoh, K., S. Shutoh, T. Kurosawa, E. Hayasaka, S. Kaneko, 2018: Genetic analysis of Japanese and American specimens of Scirpus hattorianus suggests its introduction from North America, Journal of Plant Research, 131: 91-97. Ohira, H., S. Kaneko, L. Faulks, T. Tsutsumi, 2018: Unexpected species diversity within Japanese Mundochthonius pseudoscorpions (Pseudoscorpiones : Chthoniidae) and the necessity for improved species diagnosis revealed by molecular and morphological examination, Invertebrate Systematics, 32: 259–277. 緒勝祐太郎・塘　忠顕, 2016: 山形県におけるアザミウマ類の採集記録(2)，出羽のむし, (12), 38-41. Shutoh, K., S. Kaneko, T. Kurosawa, 2017: Taxonomy and Distribution of Pyrola subaphylla Maxim. (Pyroleae, Ericaceae), Acta Phytotaxonomica et Geobotanica, 68(3): 181-192. 塘　忠顕，2017: 猪苗代湖の底生動物相（予報），福島大学地域創造，28 (2), 57-71. Takagai,Y ., R. Abe, A. Endo, A. Yokoyama, and M. Konno, 2016: Unique aluminosilicate-based natural nanoparticles in the volcanogenic Goshiki-numa pond, Environmental Chemistry Letters, 14(4), 565-569. Shutoh, K., A. Izuno, Y. Isagi, T. Kurosawa, S. Kaneko, 2017: Development of microsatellite markers for partially and putative fully mycoheterotrophic varieties of Pyrola japonica sensu lato (Ericaceae), Genes & genetic systems, 92(2): 99-103. Shutoh, K., S. Kaneko, K. Suetsugu, Y. Naito and T. Kurosawa, 2016: Variation in vegetative morphology tracks the complex genetic diversification of the mycoheterotrophic species Pyrola japonica sensu lato,American Journal of Botany,103,1618-1629. 大平　創・兼子伸吾・塘　忠顕，2016: 小型カニムシ類の付属肢を用いた迅速・安価なDNA抽出法，Acta Arachnologica, 65(2),89-95. Ohira, H., S. Kaneko, L. Faulks and T. Tsutsumi, 2016: Molecular phylogenetic analysis of Japanese soil-dwelling Mundochthonius pseudoscorpions (Pseudoscorpiones: Chthoniidae),Journal of Integrated Field Science, 13,48. 鈴木楓, 横尾善之，東鴉川の降雨流出過程と水質形成機構の推定, 平成30年度土木学会東北支部技術研究発表会, II-6, 宮城県仙台市，東北大学，2019年3月2日. 齋藤慧武, 横尾善之, 石川克典，東鴉川流域における炭素動態の推定, 平成30年度土木学会東北支部技術研究発表会, II-49, 宮城県仙台市，東北大学，2019年3月2日. Suzuki, A. S. Yabusaki, K. Suzuki, S. Kawagoe, Evaluation of regional snow distribution effect by chemical feature. 13th Annual Meeting Asia Oceania Geosciences, Suntec, Convention Centre, Singapore, August 6-11, 2017. Nemoto, S., S. Kaneko, and T. Kurosawa, Chloroplast DNA phylogeny of the Veronica subgenus Pseudolysimachion (Plantaginaceae) in Japan. International Academic Conference on the Formation Mechanism of Plant Diversity in East Asia and Conservation of Endangered Plants, Zijingang International Hotel Hangzhou, Hangzhou, China, June 24-26, 2017. Yamashita, Y., N. Satoh, Y. Isagi, T. Kurosawa, and S. Kaneko, Analysis of Genetic Diversity and Structure in Cypripedium japonicun Thunb. (Orchidaceae) Populations in Japan using Newly Developed Microsatellite Markers. International Academic Conference on the Formation Mechanism of Plant Diversity in East Asia and Conservation of Endangered Plants, Hangzhou Zijingang International Hotel, Zhejiang, China, June 24-26, 2017. Ohira, H, S. Kaneko, L. Faulks, T. Tsutsumi, Molecular phylogenetic analysis of species of the genus Mundochthonius (Pseudoscorpiones: Chthoniidae) in Japan.the 22nd International Congress of Zoology and the 87th meeting of Zoological Society of Japan, OIST(Okinawa Institute of Science and Technology of Graduate University) & OCC (Okinawa Convention Center), Okinawa, Japan, Nov 14-19, 2016. Okatsu, Y., T. Tsutsumi, Effects of environmental variables on carabid beetles (Coleoptera, Carabidae) in the Urabandai area affected by the Mt.Bandai eruption of 1888.the 22nd International Congress of Zoology and the 87th meeting of Zoological Society of Japan, OIST(Okinawa Institute of Science and Technology of Graduate University) & OCC (Okinawa Convention Center), Okinawa, Japan, Nov 14-19, ,2016. Nemoto, S., S. Kaneko and T. Kurosawa, Intrageneric classification of the genus Veronica (Plantaginaceae) in Japan based on chloroplast DNA sequences．East Asian Plant Diversity and Conservation 2016(EAPDC 2016), University of Tokyo, Tokyo, Japan, August 23, 2016. Yamashita, Y., A. Izuno, Y. Isagi, T. Kurosawa, T. Yukawa and S. Kaneko, Analysis of Genetic Diversity and Structure in Cypripedium japonicun Thunb. (Orchidaceae) Populations in Japan using Newly Developed Microsatellite Markers. 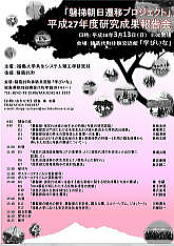 East Asian Plant Diversity and Conservation 2016(EAPDC 2016), University of Tokyo, Tokyo, Japan, August 23, 2016. Ohira, H., S. Kaneko, L. Faulks and T. Tsutsumi, Molecular Phylogenetic Analysis of Japanese Soil-Dwelling Mundochthonius taxa (Pseudoscorpiones: Chthoniidae). XVII International Colloquium on Soil Zoology, Nara Kasugano International Forum IRAKA, Nara, Japan, August 22-26, 2016. Kaneko, S., HJ. Choi, Genotype data as basic information for endangered species conservation and management. The 7th EAFES International Congress, Daegu Inter Burgo, Daegu, Korea, April 20, 2016.